Many pieces of great fine art wrap the country of Italy. Interestingly, Milan, considered as an uncommon place by the Romans themselves, is home to the original work of painter Peter Paul Rubens, ‘The Last Supper’. The painting symbolises how a deceit leading to death gracefully exists with a life giving element. On one hand it depicts Jesus and food as foundations of human existence and on the other it portrays the traitor Judas, one of the twelve disciples of Jesus, who became the cause of His mortal end. Food, an essential element of human life, has been used since ages as a lethal weapon against humans. The same filled the great Mughal dynasty of medieval India with anxiety and resulted in frequent casualties of the royals through their period of rule. In the early sixteenth century, Babur, a Turk and the first Mughal emperor of India, defeated the king of Delhi, Ibrahim Lodi, in the famous battle of Panipat. Thereafter, he promised protection to the deceased ruler’s kinsmen, including his mother. However, as an act of vengeance, the mother arranged to kill Babur by poisoning his food. She was unsuccessful in her attempt. Nevertheless, going forward, the incident marked the dawn of illegal food practice in the Mughal age. During his temporary exile in Persia, the next Mughal ruler, Humayun resided with Shah Tahmasp. Humayun was Sunni by faith and Persia was essentially a Shia kingdom. So, instead of using force, the Persian king thought of converting him through frequent offerings of exotic and expensive meals. Initially, Humayun tactfully resisted Shah’s intention. However, later, for his safety, he decided to falsely submit to the king’s wishes. To this end, he went on a pilgrimage to Sheikh Safi’s tomb, which otherwise is considered rather uncharacteristic of a Sunni. This event further strengthened the Mughal fear with regard to the havoc food can play on them. Nonetheless, Mughalai cuisine evolved with the passage of time with many important inputs from the Persian cuisine and otherwise. 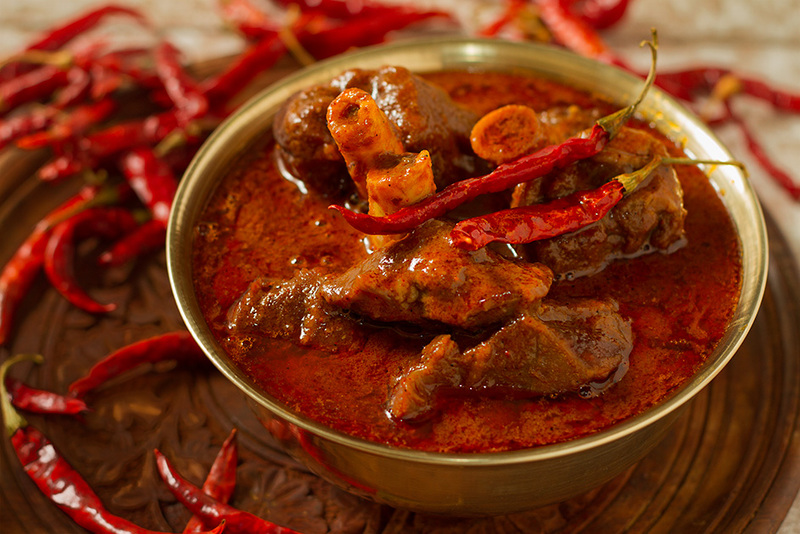 Today, the cuisine and its fairer cousin, the Awadhi Cuisine, have become extremely popular worldwide. The delightful Mughlai food such as Naan, Dum Pukht dishes, Harissa and others, further brought significant recognition, on a macro level, to Humayun’s successor, Akbar. Dum Pukht is a hundreds of years old Indian style of food preparation in which an endeavour is made to increase the taste of the food significantly while making economical use of flavouring substances. It involves slow cooking of food on low flame over an extended time period using minimum liquid. As much as possible, care is taken to cook the food in a closed vessel in order to trap steam and thus, conserve the flavours of the food. This method not only makes the food more tasteful, but also renders it healthy. Naan is one of the age old breads from the central Asian region, typically baked in a clay oven, popularly referred to as tandoor. Its dough is made from flour, yeast, water and yogurt. Today, however, many delicious versions of it are available to be enjoyed. Historically, it was compulsorily included in the meals of many Muslim rulers of medieval India. Next, Harissa is a special kind of hot and pleasant smelling flavouring paste. As even a little quantity of it tastes really sharp thus, adding the same to food can result in producing a thriving effect. As the Mughals became extremely affluent by the termination of Akbar’s rule, the political threat posed by food assumed an awfully serious form. In addition, as strong drinks had been very popular with the Mughals since long, excessive consumption or deadly chemical alteration of the same, later, became one of the major reasons of the downfall of the Mughal dynasty. Post Akbar era, many Mughal nobles became victim of the abuse and its associated unlawful modifications. As the sedative is addictive thus, it became a convenient weapon to cause harm. There are many instances in history, where alcohol or its unfortunate poisoned form claimed not only an individual’s life, but also became the cause of casualty on a greater level. In the Mughal era, ladies, in particular, were given charge of the valued aspects of nobles, including a ruler’s food and drinks. During the reign of the Mughal sovereign, Shah Jahan, his daughter and a courtly lady were responsible for overseeing and protecting his food from venomous substances. Although he survived the prevalent corrupt food practice, he was ruined by the aspiration of his own son, Aurangzeb. Next, despite taking extensive measures, the Nawab of Oudh, Nasir-ud-din Haider Shah was murdered by being offered poisoned sorbet. In the present day world, the crime of poisoning someone through food and drink is quite common as well. Hence, for safety reasons, nowadays increasing number of dignitaries and VIPs use the service of food testers whose job is to detect any dangerous element in their food, ahead of serving. Truly, food and drinks that keep us happy and going, can, at times, haunt us if offered otherwise for wrong reasons. Yet, we celebrate food….